Above (in my rather inexpertly rendered panoramic view) is my new kitchen. Your comments on my last post were all really helpful and/or encouraging, so I’m back for more. Here’s my problem: THERE. ARE. NO. COUNTERS. Okay, this isn’t as big as deal as my caps-lock might have you believe. I mean, it’s not like I didn’t know about this before I moved in and my last apartment only had about 3-4 feet of counter space anyway. If you click through to Flickr, you can see my notes on what I’m thinking of putting where (and what I’m not going to do, like screw shelves into the wall that the electrical breakers are on — yikes). Addendum: Under the jump are my own (somewhat disjointed) thoughts and ideas. 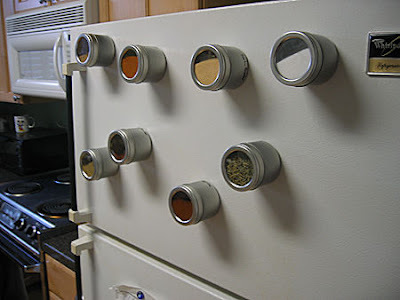 — The cabinets are metal, so I’m going to pick up some of those magnetic spice jars to stick inside the cabinets. — As much as I don’t want to drill a zillion holes into the rented walls, I sort of don’t see much of an option otherwise. Thinking about a wall rail/rack above the sink and wall shelves to replace the little green table there on the right. — I got this little towel rack (it hangs on the door to the cabinet under the sink) and I love it so much, I think I’m going to get another one for the bathroom. What immediately springs to mind is adding a counter under the window between the stove and the wall. Once I made a closet into a desk/office space. I went to Home Depot with the measurements and had them cut a piece of wood down to size and then mounted it with l-brackets (I’m going to go out on a limb and assume you don’t have tools of your own or access to a woodshop). Anyway, this would be an inexpensive option for adding a wide shelf under that window – nowhere near the height you’ll want for cutting/chopping, but perhaps a nice space for storing appliances, food cannisters, etc. And then your recycling containers would fit underneath, or you could put other boxes under there for storage (put casters on them so they slide out easily). Those cabinets look ridiculously high, but it looks like you could fit a shelf underneath them? Lots of under-utilized wallspace, which is a big plus! While you were writing this, I updated the post with some ideas I had as well. I think I’m going to do one of those Ikea wall rack things, so I have a place to put dishes while they dry that isn’t on the counter. I’ll probably put another on the wall behind the stove for cooking utensils. IKEA has some great base cabinets that are freestanding. We bought a work table that’s about 24″x24″, with a large drawer for utensils, and two open shelves for pots and pans, and a butcher block countertop included, for $169. I use it all the time for preparing food, except I use a large plastic cutting board on top of the wooden countertop when handling meat. They also have other freestanding units that will hold a deeper countertop than the base cabinet, providing an eating bar plus lots of storage underneath. You do have to occasionally oil the countertops, but you can get food-grade mineral oil at Target for $1.59, which lasts a long time. Like Lynn, my brain went right to IKEA. My cousin has a wee apartment in Brooklyn which, like yours, has NO counter space. So her landlord let her pick out a piece from IKEA before she moved in. It sits opposite her sink/stove, so it makes for like a little galley kitchen. It’s hard to tell dimensions from your photos, but could you put it where the little green dude is now, coming off the wall like a peninsula? We have a similar towel hanger…just beware that you will probably catch your hip (or some other body part) on it regularly. I still use it though, even with the constant risk of bruises. Do you have room for a counter height kitchen cart? This is the best solution I’ve seen for the no counter problem.